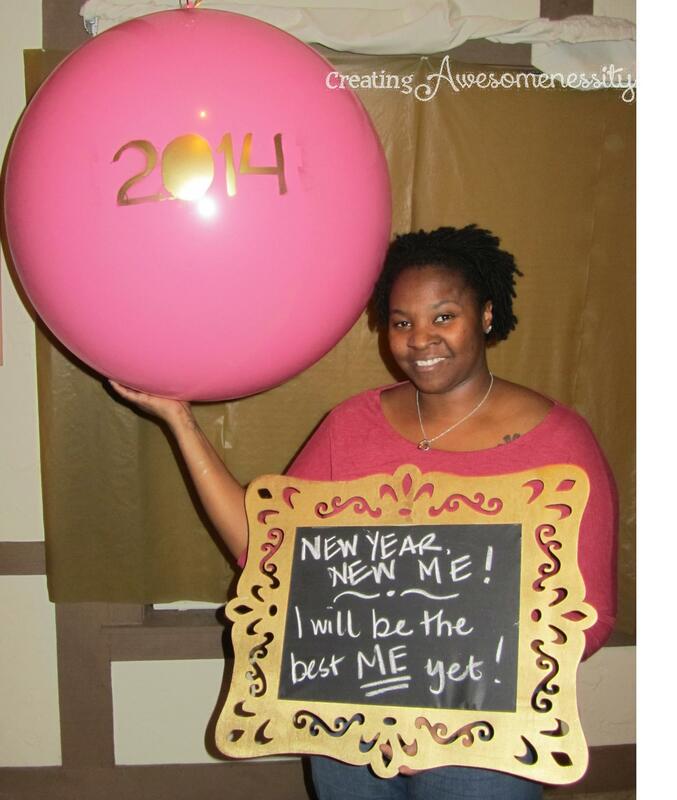 It's A New Year...Time For A New Me! - Creating Awesomenessity! 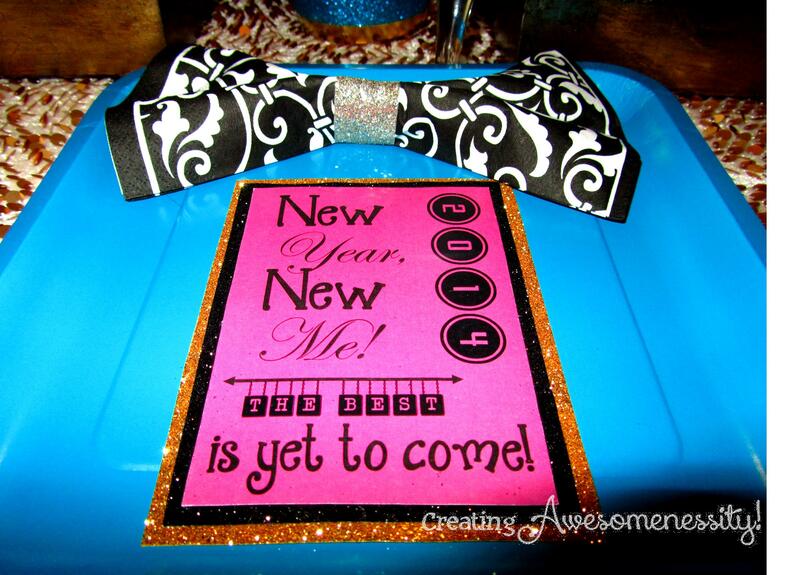 You are here: Home / Holidays / It’s A New Year…Time For A New Me! 2014 is just around the corner and I’m ready for all of the things that the next year has in store for us, personally and professionally. So many doors have opened and opportunities have presented themselves this year, I’m so incredibly optimistic for the next year…and the years beyond. My friends and I have been through a lot this year…good and bad, full of lessons and adventures. 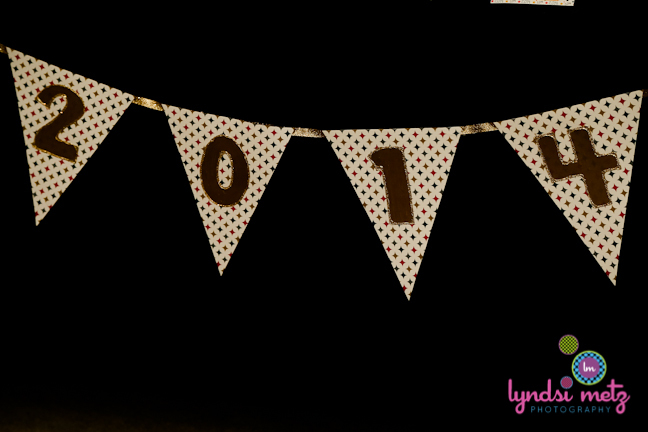 So to celebrate the freshness of a new year, we had a New Year’s Eve party with the theme “New Year, New Me 2014” and it was one of the most jovial nights I’ve enjoyed in a long time. 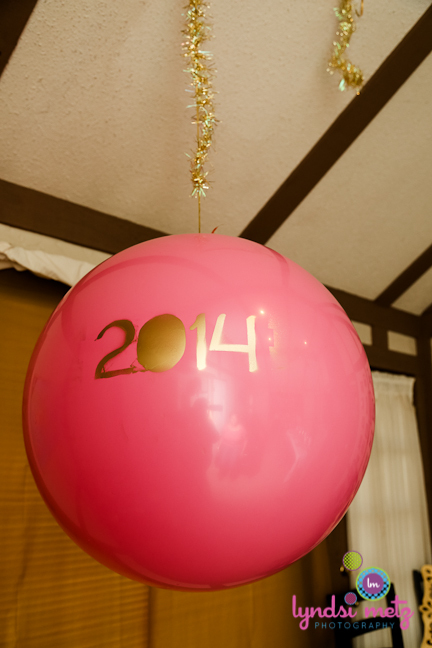 Hosting an intimate NYE event is not really that hard. Especially for me…I’d much rather spend an evening with family and friends than be out partying it up in the streets. A homebody event planner. Go figure. 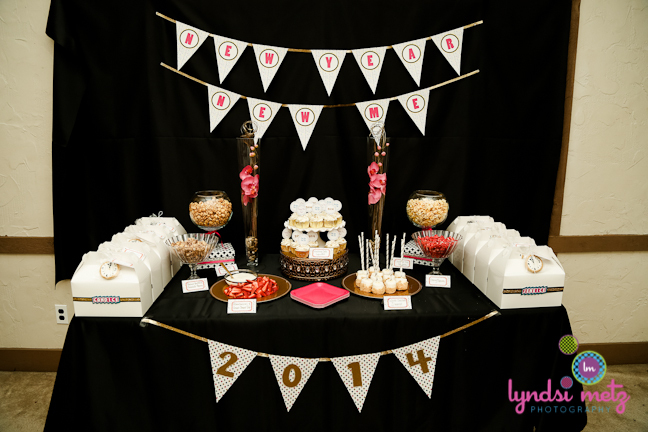 The decor and colors of the shower were based on a set of party printables that I won in a giveaway from Cupcake With Character. I love bright colors and was excited about incorporating the color scheme. It wasn’t the usual print that is usually associated with a NYE party and I was totally OK with that. So I picked the traditional black and gold, for timeless elegance, and the not-so-traditional, hot pink and turquoise, for spunky fun! My husband said it looked like two parties hanging out together. For our party, we centered it around a wine tasting. We had a delicious stash from Mirassou Winery. 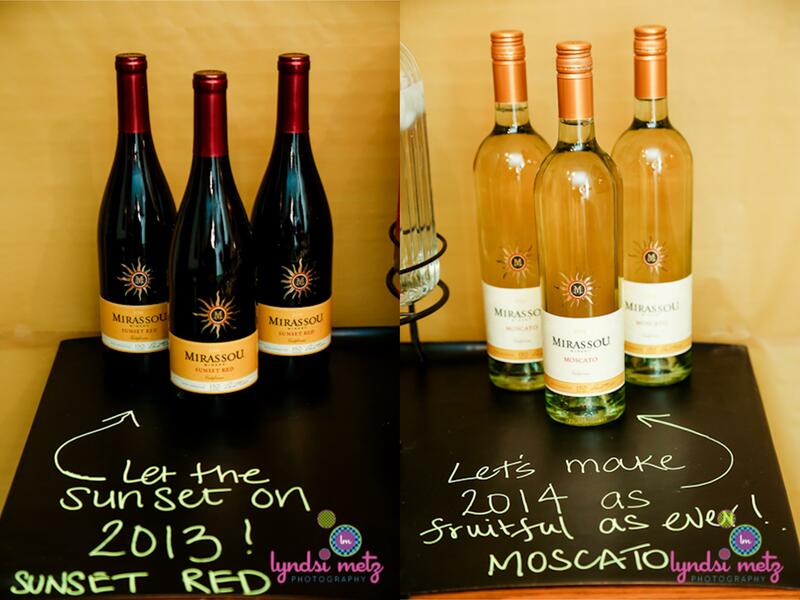 The 2 wines we enjoyed were the Sunset Red and Moscato. 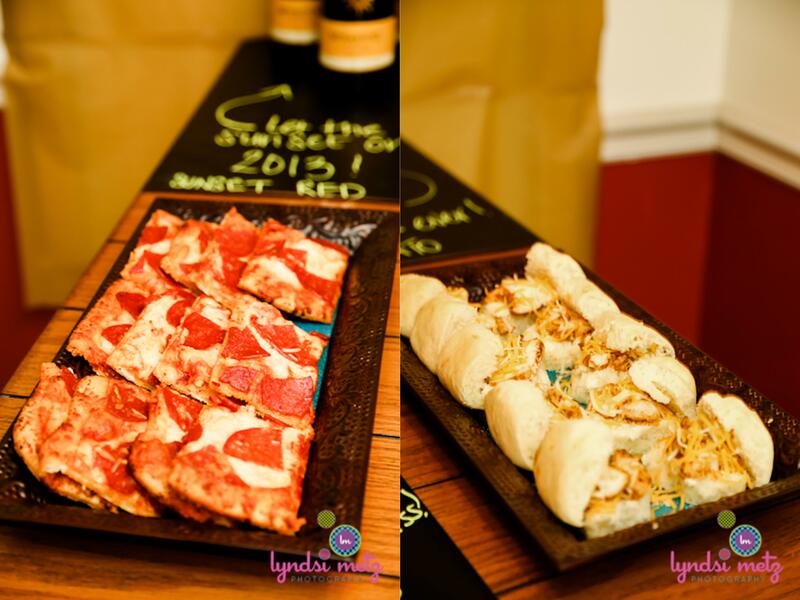 To accompany the wines, we snacked on pepperoni pizza, Teriyaki chicken sliders, and Colby jack and cheddar cheese. For the one friend in attendance who didn’t actually drink, we had punch and water; the recipe was one that I’d previously used at a baby shower and was a big hit. 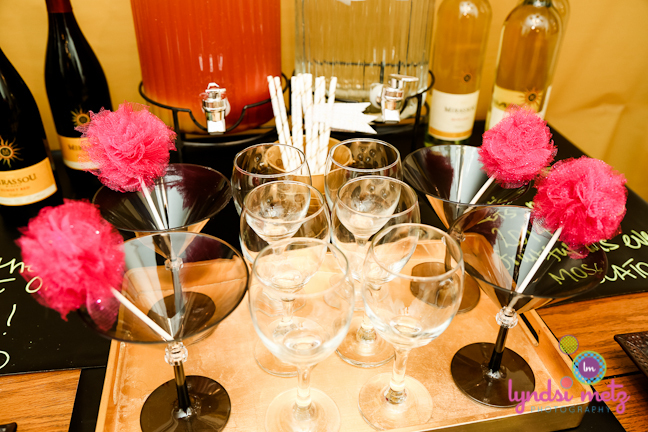 We also had tulle poms/swizzle sticks provided by Fizzy Party and they are so much fun to have in your glass! 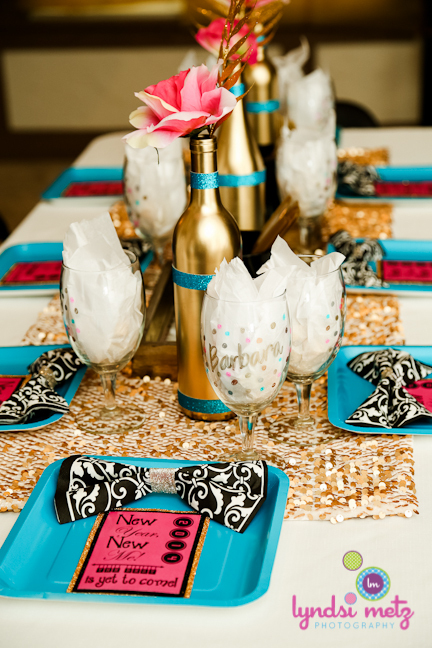 The dining table set up was of hot pink and turquoise plates, with black napkins and champagne-colored bands. 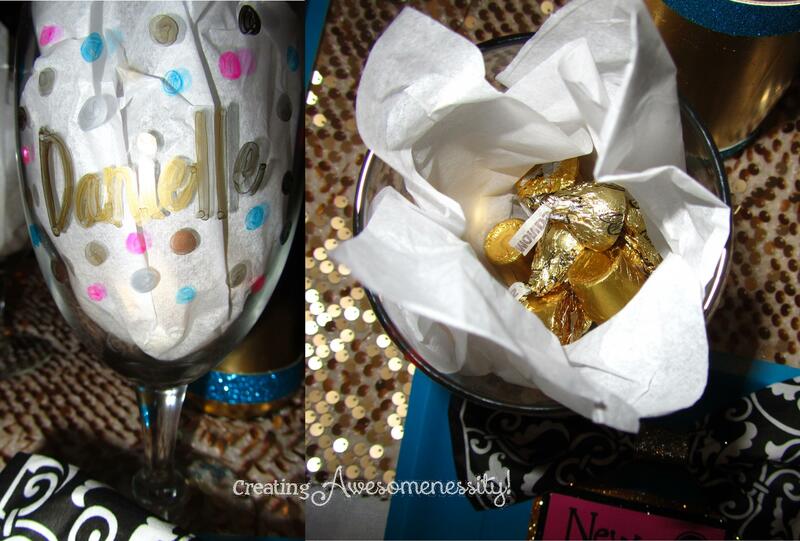 Each place setting consisted of a personalized goblet, filled with Rolos and almond Hershey’s kisses, as well as an inspirational keepsake. 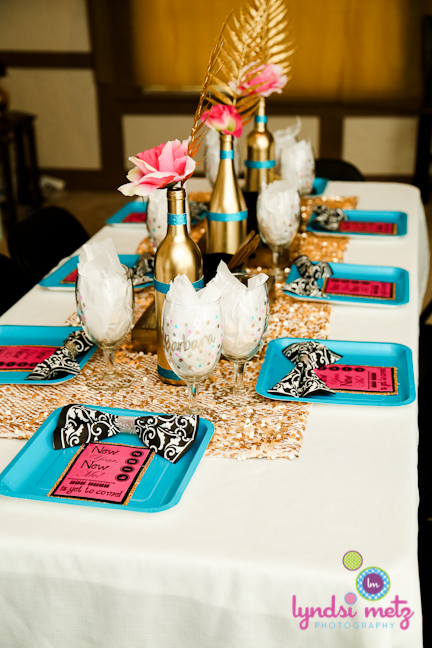 The table scape was a gold sequin runner that was centered in the table, and dressed up with recycled wine bottles spray painted gold and trimmed in turquoise glitter ribbon. 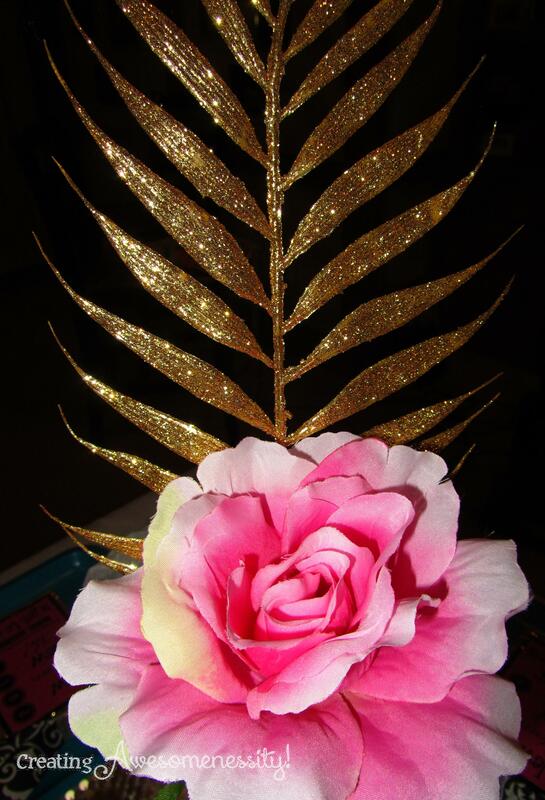 The flowers were left over from another event and the gold sprays I found for $1 at Michaels. 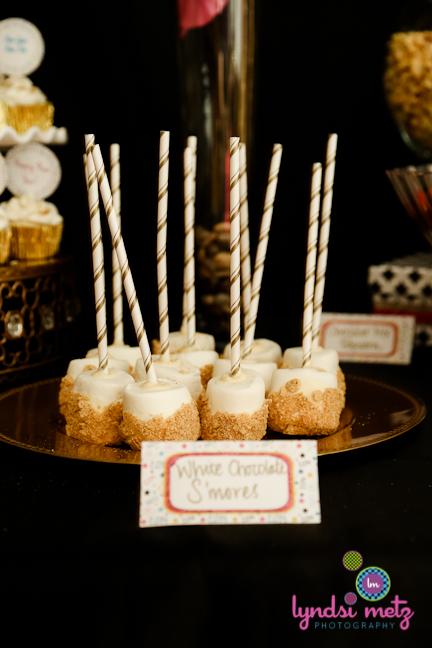 The dessert table was (obviously) our (my) favorite party of the party. 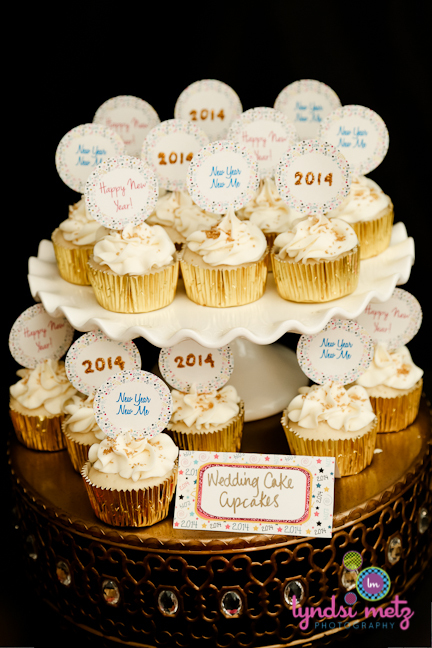 The printables got to strut their stuff on the dessert table. 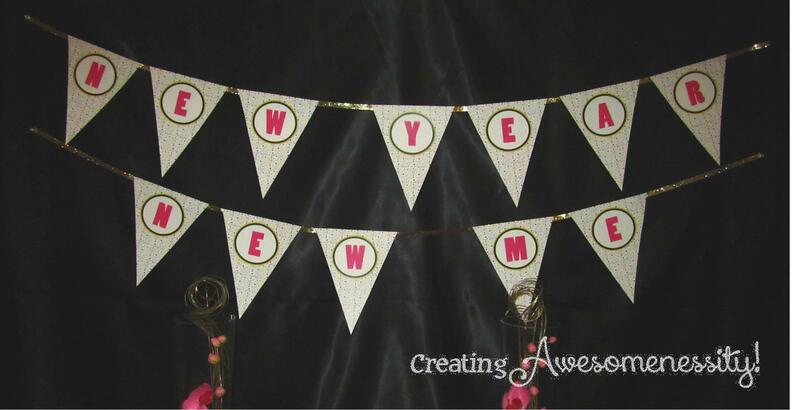 The banner was customized for our theme and hung with gold glitter ribbon against a black backdrop. 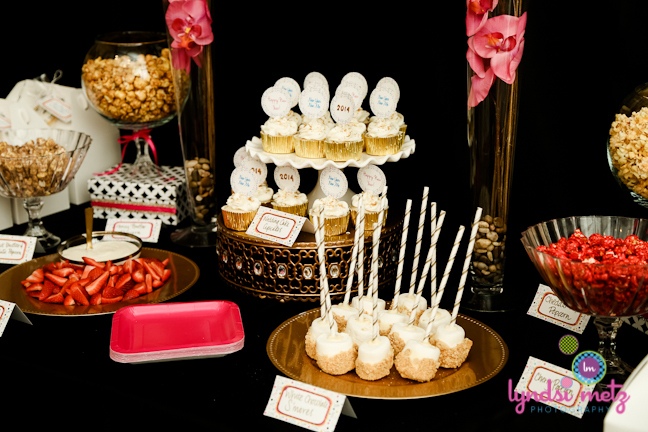 The sweet stuff on the table was a simple menu of fresh strawberries with cream cheese dip, jumbo white chocolate s’mores, wedding cake cupcakes, and a popcorn bar. 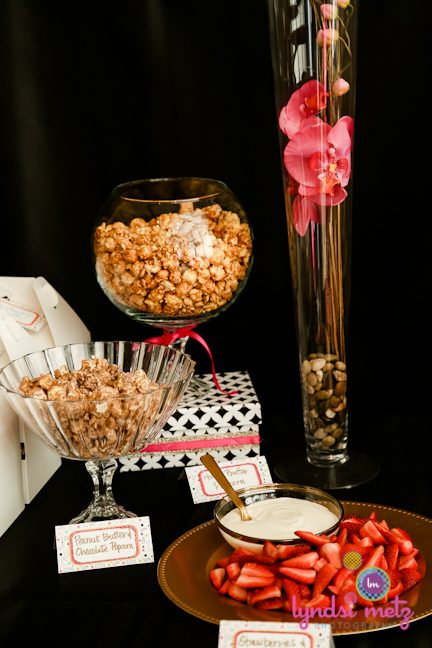 The popcorn came from Sweet Noshings, which is a local candy store/popcorn corner/coffee bar. We got to nosh on Peanut Butter and Chocolate, Honey Butter, Cherry, and Spicy White Cheddar and Cheddar Cheese mix varieties of popcorn. The other element on the table was a gift box for all of the guests. 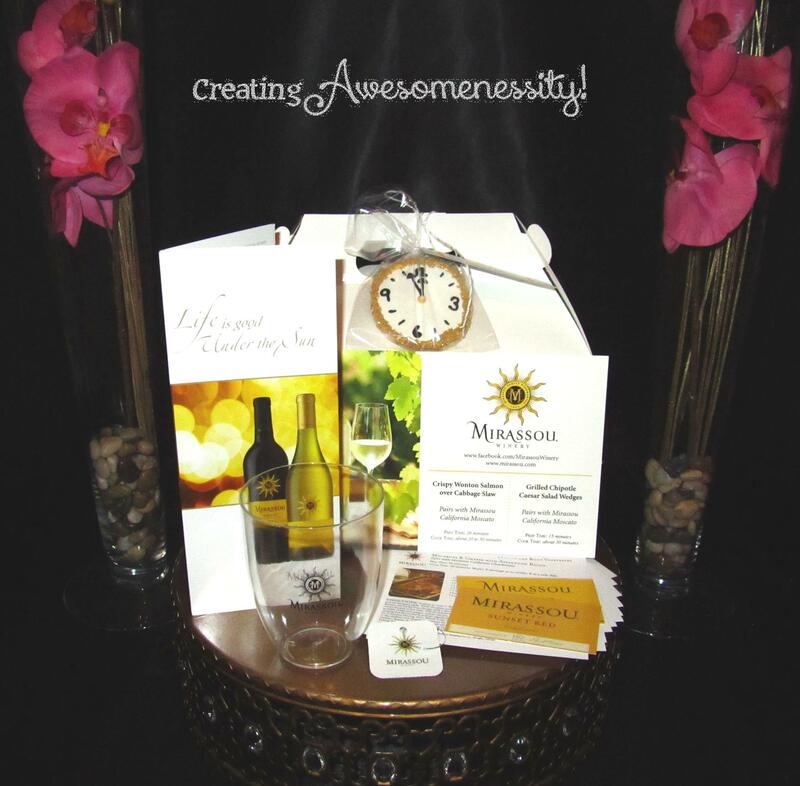 The gift boxes contained a bunch of goodies from Mirassou and included a over a dozen different recipes (which can be made with the various Mirassou wines,) a wine charm, a stemless wine glass, and a brochure about the fabulous winery. 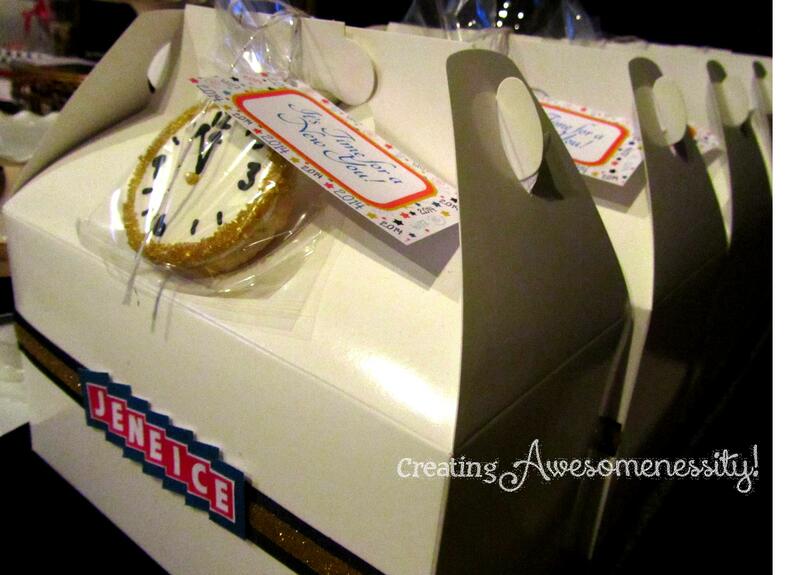 The gift boxes were also personalized with each guests’ name. 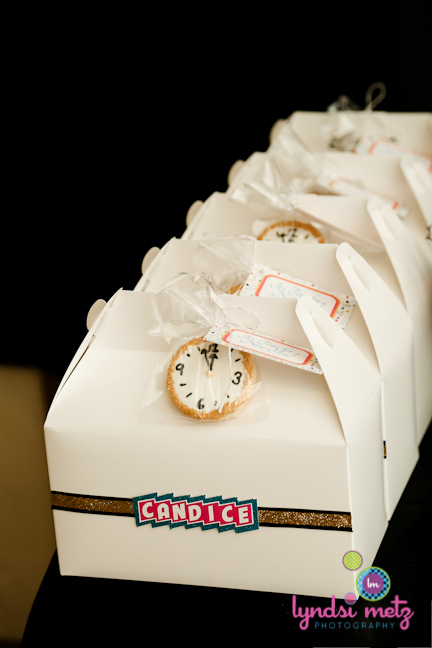 They were tied with white and gold twine, and held a countdown clock cookie, made by the awesome Jess Add Sprinkles, and a tag I created, which said “It’s time for a new you!” All of the ladies were impressed with her art…they didn’t know it was a cookie, and they loved it! 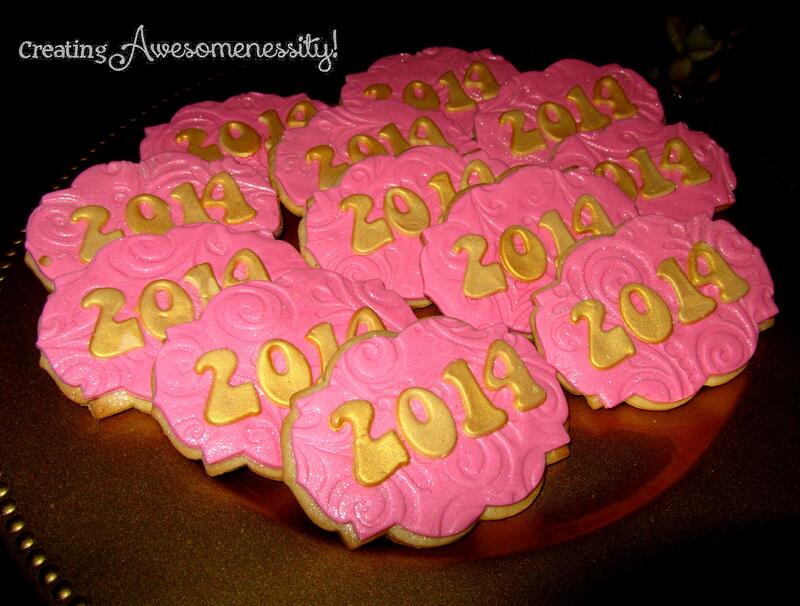 We also had some fantabulous cookies that Kima’s Konfections sent to the party, but they didn’t get to be on the table because of the ice storm that we had. And by ice storm, I mean that we got 1/4″ of ice and the city shut down. Even though they didn’t make it to the shindig, I was still able to get them to the guests. I mean, how could this beauty not be shared with them?!? All in all, we had a great time 🙂 The weather outside was frightful, but my friends were so delightful! 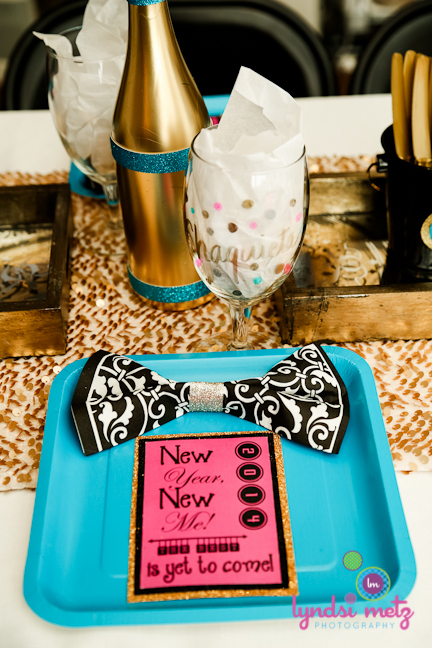 This party is perfect for throwing an intimate NYE gathering or just a girls night in. Very budget friendly, the wines run under $10 a bottle, and taste wonderful! If you want to opt for something sans alcohol, think spa night, movie night, or even a game night! We brought in 2012 with a Wii party with our friends and it was a blast! Celebrate life! 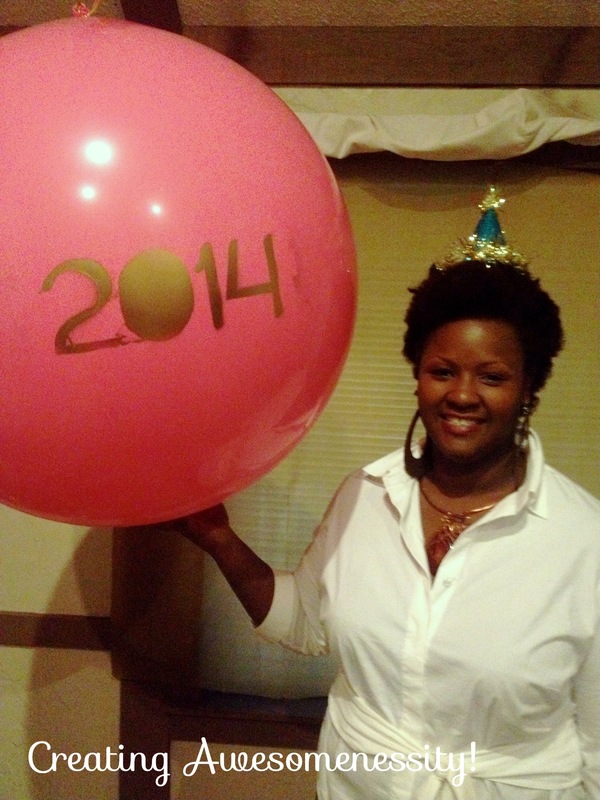 Cheers to a New You and a Joyous and Prosperous New Year! Concept and Styling: Creating Awesomenessity! Love Love Love ! What a super party and I love how you incorporated the different colors everything fit in so perfectly. 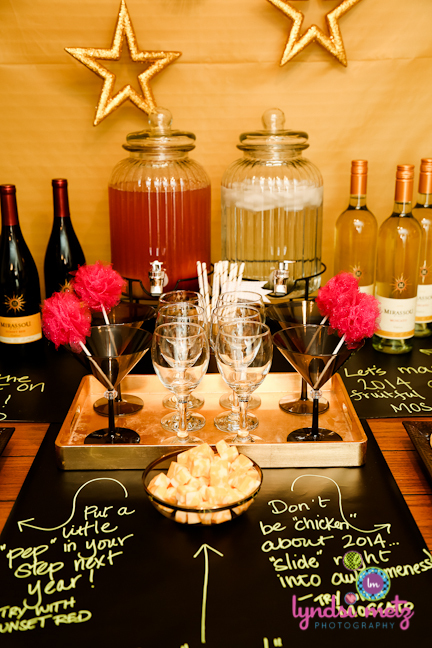 Love the idea of the wine tasting and the cute way you set it up. The Tulle Pom Swizzle Sticks adorable touch to the glasses and the invitations very pretty and help make the table setting so elegant. Your Dessert Table fabulous GREAT JOB Katherine!